So named because it gives a temperature reading very quickly, an instant-read thermometer is an essential food safety and sanitation tool. An instant-read thermometer consists of a stainless steel stem that serves as a temperature probe, and either a dial or a digital readout. One advantage of the analog type (the kind with the dial) is that they can be calibrated relatively easily, so you'll be sure of always getting a true reading. Note that an instant-read thermometer is different from a meat thermometer. An instant-read thermometer is used for taking a quick temperature reading of an item, but you don't leave it in the food while it cooks. A meat thermometer is inserted into a piece of meat before roasting and is left in the roast during cooking. An instant-read thermometer is ideal for checking the temperatures of liquids such as stocks and soups, making sure they are cooling quickly enough to minimize the growth of bacteria; or for checking the temperatures of hot foods that are being held for service on a buffet. 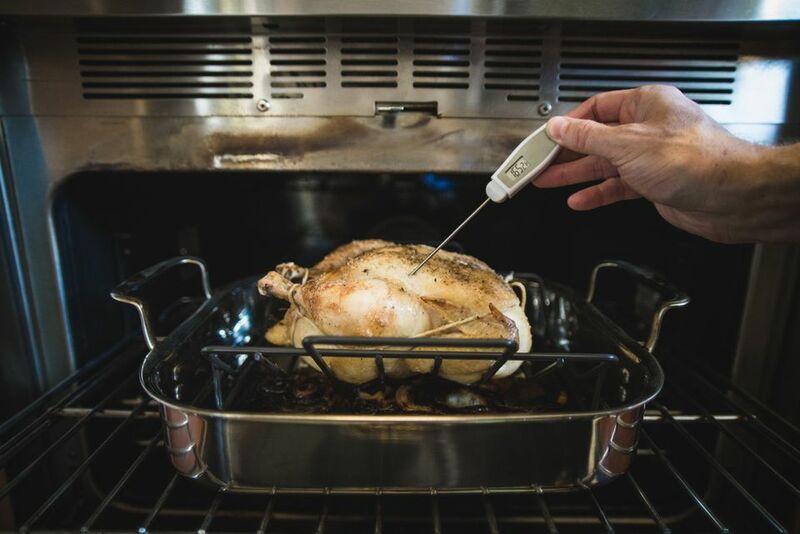 It can also be used to check the internal temperature of a roasting chicken. Insert the stem into the deepest part of the thigh, where it meets the breast, making sure not to hit bone. Just remember that each time you pierce the bird like this, some of its juices escape, causing it to dry out. Take care to wash and sanitize the thermometer's stem after it has been inserted into a food product (such as the undercooked poultry mentioned above) and before using it again on another item. Otherwise, you risk passing bacteria from one product to another, which is called ​cross-contamination. Bumping or dropping the thermometer can knock it out of calibration, so it's a good idea to check its accuracy from time to time. The easiest way to do so is to fill a glass with a mixture of half water, half ice, and stir it around for a few seconds. Insert the thermometer stem into the ice-water and wait for the needle to stop moving. If it reads anything but 32 F, you need to recalibrate. To recalibrate, you must leave the stem immersed in the ice-water bath as described above. Use a small wrench (sometimes one is included with the thermometer) to loosen the nut behind the dial. Then rotate the dial face until the 32 F mark is directly beneath the needle, then re-tighten the nut. Good instant-read thermometers can be purchased for just a few dollars. To make sanitizing your thermometer easier, "self-sanitizing" models are also available. Or, just pick up a container of sanitizing wipes for cleaning the probe after each use.